Danville Dental Associates Helps Children Practice Oral Care! At Danville Dental we feel that it is important to remind patients that February was National Children’s Dental Health Month, an occasion celebrated by dentists across the country. 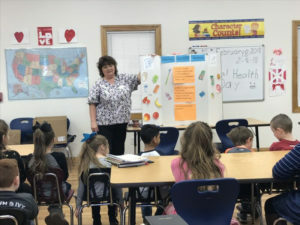 To give back to the community and help children take the right steps to have better oral health, dentists and staff from Danville Dental Associates have taken the initiative to perform presentations at schools in the Danville community. In today’s post we’ll be reviewing our journey to schools around the area. To us, it’s important to give back to the community, and helping children maintain good oral health is one of our most important values. The purpose of Children’s Dental Health Month is to teach children of all ages the importance of keeping your mouth clean and healthy. Children are particularly vulnerable to cavities, so making the effort to improve their oral care habits will make a huge difference for them later in life. Our staff accomplished this through demonstrations and activities we thought would be fun for the kids. Our mission to educate students brought us to many difference preschools and elementary schools around Danville. While some of the presentations were given to smaller groups, around 20 to 30 students, others involved speaking to over 100 kids at a time! Luckily, that wasn’t a problem for our experts from the practice. 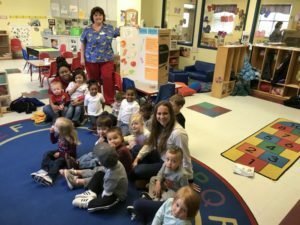 By the end of the month, Dr. Chris Payne and several hygienists had spoken to over 1,000 kids at 15 preschools and elementary schools. Here are a few photos of our experience; we can’t wait to do it again next year! 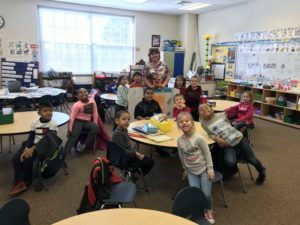 Tammy Betterton with a class at Brosville Elementary, where she presented to 53 students. Tammy Betterton posing with students and teachers at Family First Children Center. 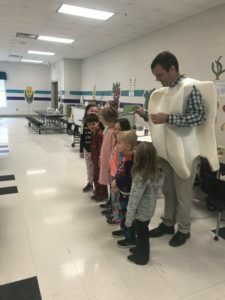 Dr. Chris Payne dressed as Molar Man and educated 100 students with hygienist Sandi Henderson at Twin Springs Elementary. As part of our ongoing initiative to support children and their oral health, we wanted to offer a few important tips that you can use to help your child improve their oral care routine. When brushing, use no more than a pea-sized amount of toothpaste after they reach three years old. Make sure to supervise and remind them not to swallow any toothpaste while they brush. Once two teeth touch, start cleaning in between their teeth as well. Make sure they have a child-sized toothbrush that fits their mouth. To celebrate the month, print out these fun color charts for your children. Have them hang them up in the bathroom to remind them of the important steps to take while brushing. Have more questions about children’s oral health? Schedule an appointment with Danville Dental Associates today! Dr. Christopher A. Payne earned his Doctor of Dental Surgery degree from the Virginia Commonwealth University’s Medical College of Virginia School of Dentistry before he started practicing at Danville Dental Associates. Since then, he’s continued his education and given back to the community by volunteering with many charitable organizations. To learn more about his dental care for children or practice, contact him through his website here. Comments Off on Danville Dental Associates Helps Children Practice Oral Care!